I recently picked up three laser cut paint stands from Vallejo. Two of the corner, and one of the front modules will set you back about $60 from Amazon.com. I didn't quite realize how large the racks would be until I had them assembled and on my desk. Each of the racks connects to the other. Mounting 'hardware' is included. I was a little disappointing that the larger diameter holes along the top edge are too small to accommodate my large Tamiya bottles. They are the perfect size for P3, Mig, GW, and small Tamiya bottles. This represents less than half of my Vallejo paints so I plan on purchasing three more of the front module paint stands which I plan on placing under and forward of these. It will require me to build a custom stand but I think once it is all done it will work quite well. 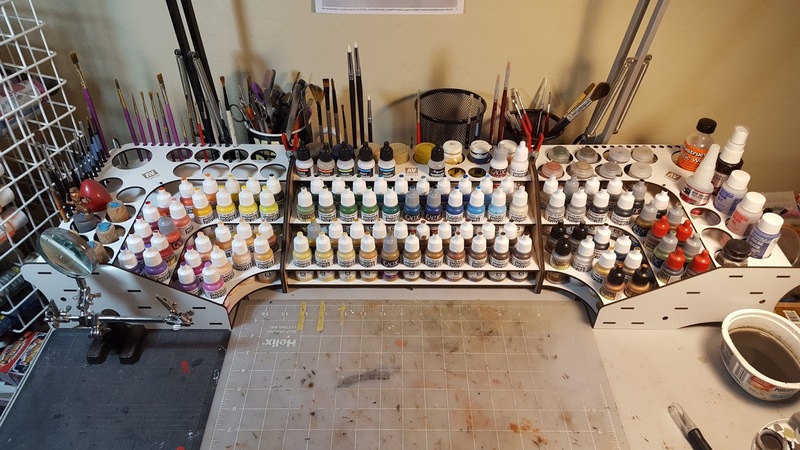 I have also decided to change the mounts of my overhead lamps to the sides of my desk so that I can slide the paint stands back flush to the wall.